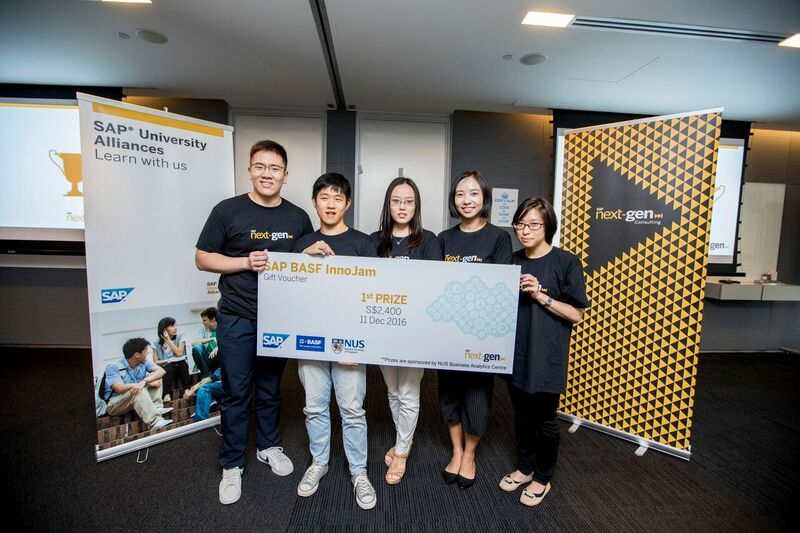 Singapore – December 23, 2016 – Team Innobrew was the winner at the first SAP BASF InnoJam in Southeast Asia held from December 9-11, 2016 in Singapore. The winning team comprised of students from the Masters of Science in Business Analytics program at the National University of Singapore. Team Innobrew was among the six finalists that made it to the deciding face-off on December 11. The team’s winning entry was an end-to-end process management app for automated demand forecast, order and delivery tracking to payment, and freight cost estimation for the Customer Service Manager. “With a mindset of enjoying the challenge, we did our best to understand the customer’s pain points, and learn from the best mentors from SAP and BASF. When teamwork kicked in, we knew we had made it!” said Yuwen Xu, Innobrew team leader. 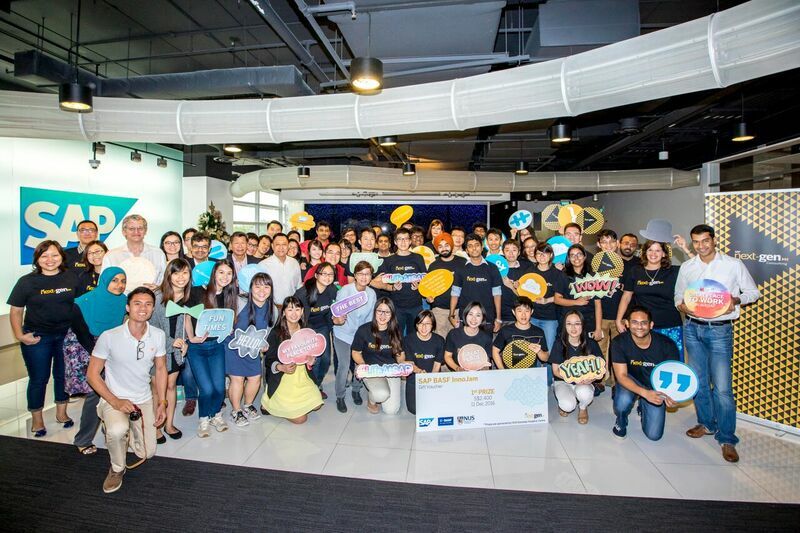 Being the first in Southeast Asia, this InnoJam was one of key deliverables under SAP’s Next-Gen initiative which is a strategic youth innovation service where young talents engage with industry partners to work on real life challenges using design thinking and SAP technologies. With one of the highest standards of education, Singapore was a natural choice to pilot this innovative concept and to promote collaboration between corporations and educational institutes. More than 80 students from local Institutes of Higher Learning signed up with six teams making it to the final face-off. The event was organized by SAP and was sponsored by the world’s leading chemical company BASF and by National University Singapore Business Analytics Centre. The contestants were posed with a real business challenge that BASF’s Construction Chemicals division is facing. The competing teams were given real, but anonymized data to analyse the current materials ordering process at BASF, ideate solutions and develop a prototype to address the challenge. As market leader in enterprise application software, SAP (NYSE: SAP) helps companies of all sizes and industries run better. From back office to boardroom, warehouse to storefront, desktop to mobile device – SAP empowers people and organizations to work together more efficiently and use business insight more effectively to stay ahead of the competition. SAP applications and services enable approximately 335,000 business and public sector customers to operate profitably, adapt continuously, and grow sustainably. For more information, visit www.sap.com. At BASF, we create chemistry for a sustainable future. We combine economic success with environmental protection and social responsibility. The approximately 112, 000 employees in the BASF Group work on contributing to the success of our customers in nearly all sectors and almost every country in the world. Our portfolio is organized into five segments: Chemicals, Performance Products, Functional Materials & Solutions, Agricultural Solutions and Oil & Gas. BASF generated sales of more than €70 billion in 2015. BASF shares are traded on the stock exchanges in Frankfurt (BAS), London (BFA) and Zurich (BAS). Further information at www.basf.com.